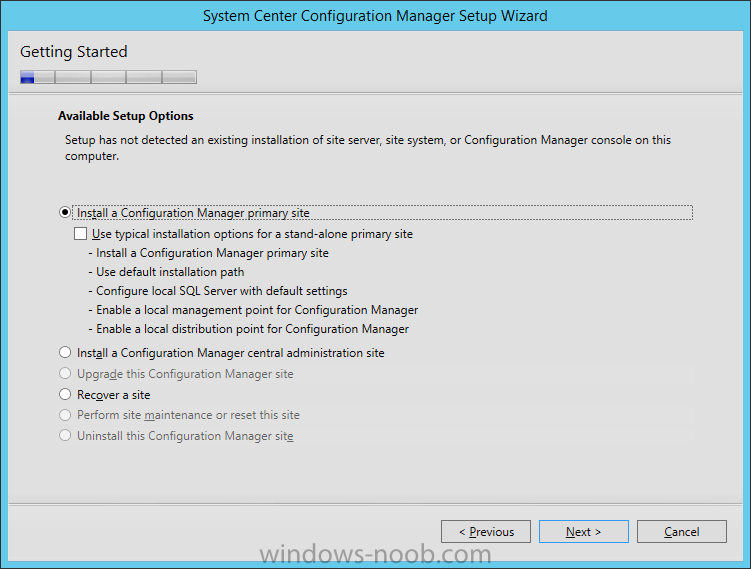 How can I install System Center Configuration Manager (Current Branch) ? Microsoft have been hard at work developing the next version of Configuration Manager (after System Center 2012 Configuration Manager). Up until now they've released a bunch of Technical Previews and today they've announced the General Availability of the RTM release, along with it's official name: System Center Configuration Manager and Endpoint Protection (version 1511). The version used in the product name specifies the YY/MM (year/month) that it was released. Note: There is a newer version of this guide which uses Server 2016, SQL Server 2016 and SCCM 1606CB here. This release is the first Current Branch release of Configuration Manager. This release has the ability to update itself based on your choices (Software as a Service SAAS) so as Microsoft releases newer versions of Configuration Manager to the Enterprise in the coming years, the Current Branch version identifier will change too (for example to 1607, 1611, 1702 etc). This is explained in Brad's post here. 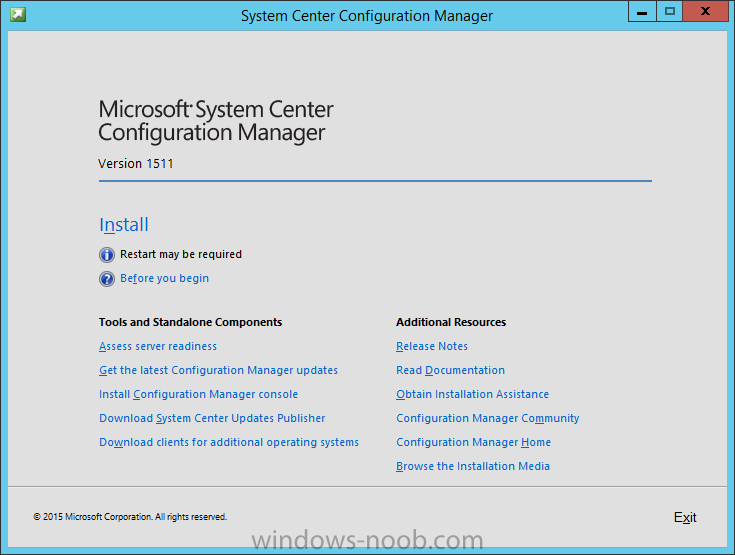 This long and detailed post will guide you through installing System Center Configuration Manager version 1511 using some automation via scripts, and you get to choose between two installation methods, manual or unattended. Regardless of what method you use to install ConfigMgr, this guide will configure everything correctly so that your environment is ready to manage all devices and to do Windows 10 servicing via Software Update Management, which is a topic that will be covered in a later post. 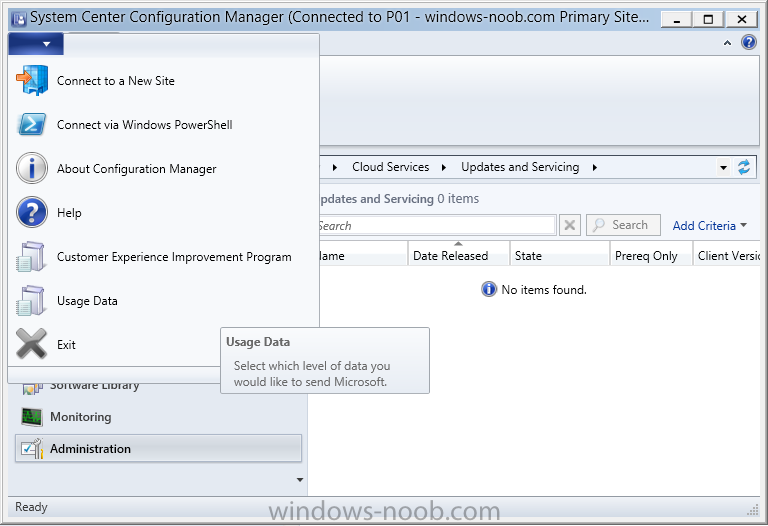 Lastly, the guide looks at the Service Connection Point role settings, how you can change them and how to configure Usage Data. You can read the release notes for System Center Configuration Manager version 1511 here. Recommended hardware for System Center Configuration Manager here. 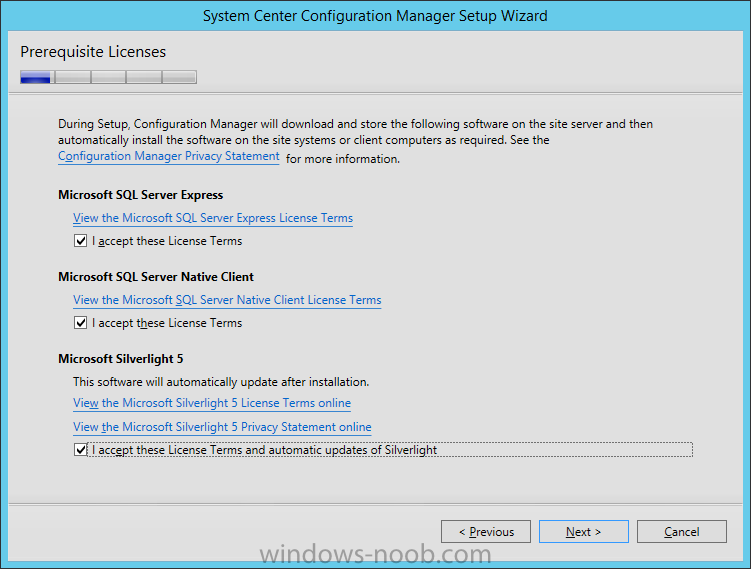 Supported operating systems for sites and clients for System Center Configuration Manager here. 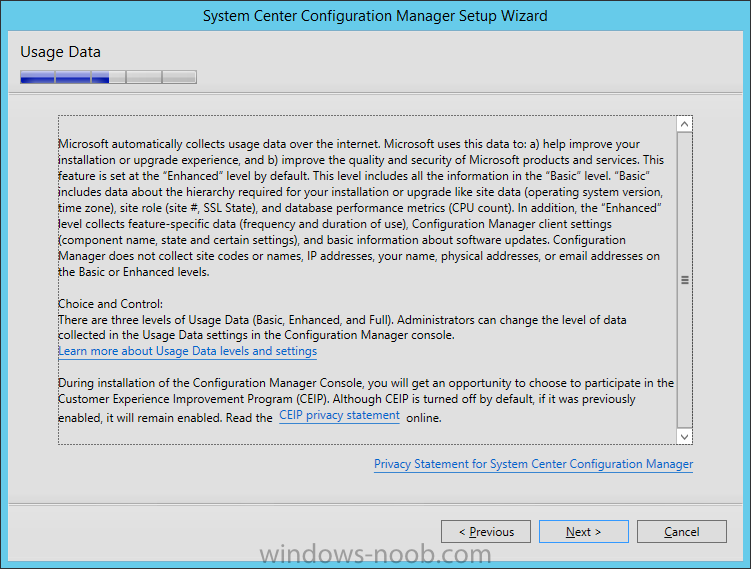 Support for SQL Server versions for System Center Configuration Manager here. 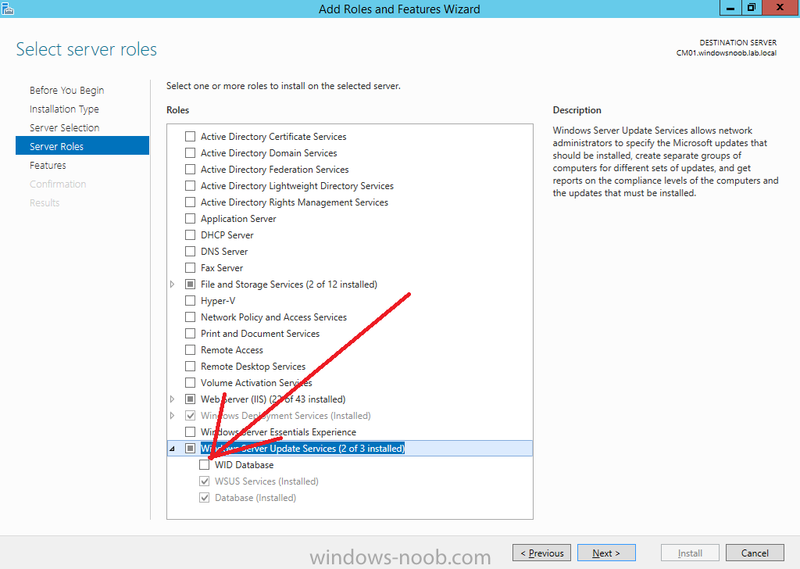 Support for Active Directory domains for System Center Configuration Manager here. 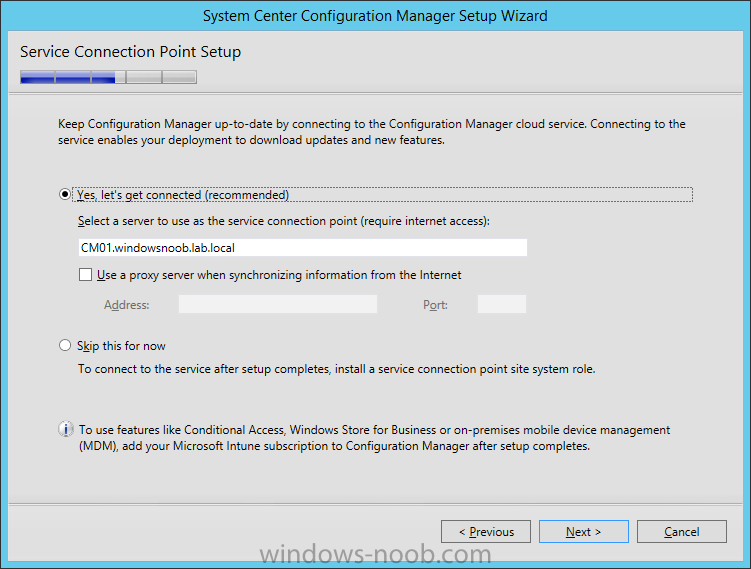 Support for Windows features and networks in System Center Configuration Manager here. 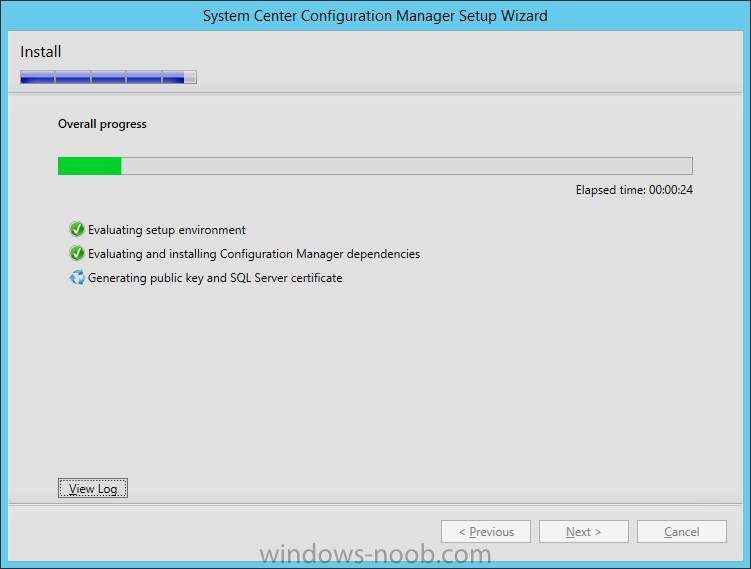 Support for Virtualization Environments for System Center Configuration Manager here. In this guide I assume you have already installed two servers running Server 2012 R2 as listed below, I also assume you have some knowledge of PowerShell, if you don't, start learning it now ! Configuration Manager server, joined to the domain. A Linux firewall running on 192.168.5.199 purely for sharing internet into these vm's. 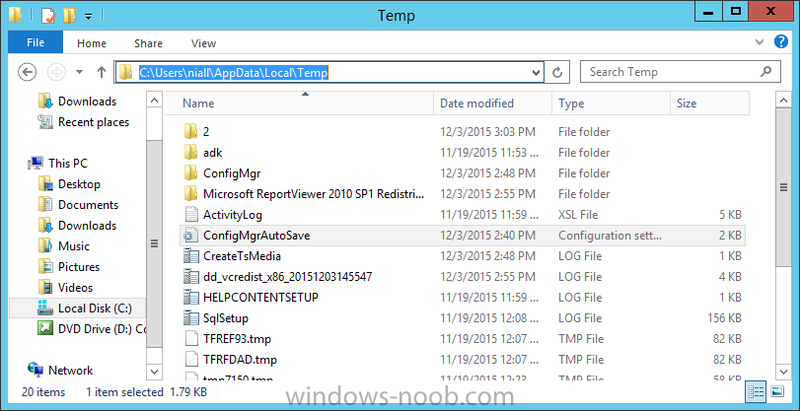 The scripts used in this guide are available at the bottom of the guide in the Downloads section, download them before beginning and extract them to C:\Temp on your ConfigMgr server. To allow SQL to replicate data, open the following TCP ports in the Configuration Manager firewall, 1433, 4022. 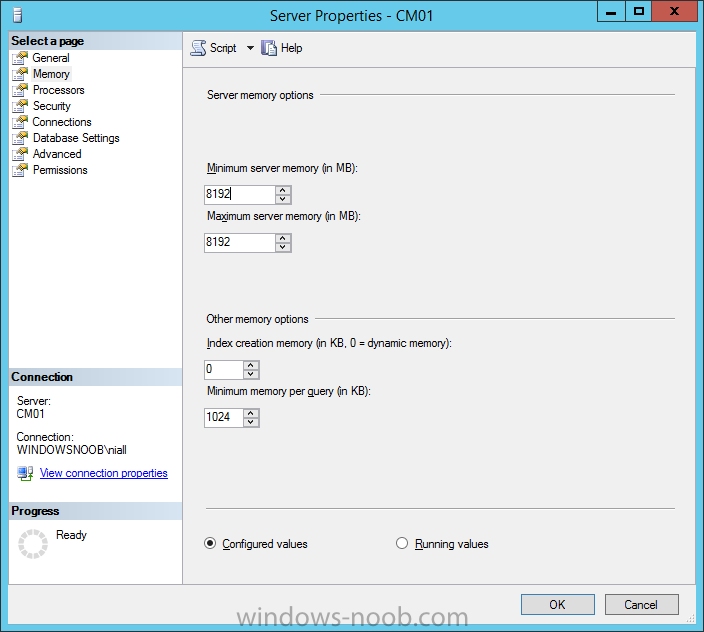 You can do this by targetting your ConfigMgr servers with a GPO. To create the GPO do as follows. 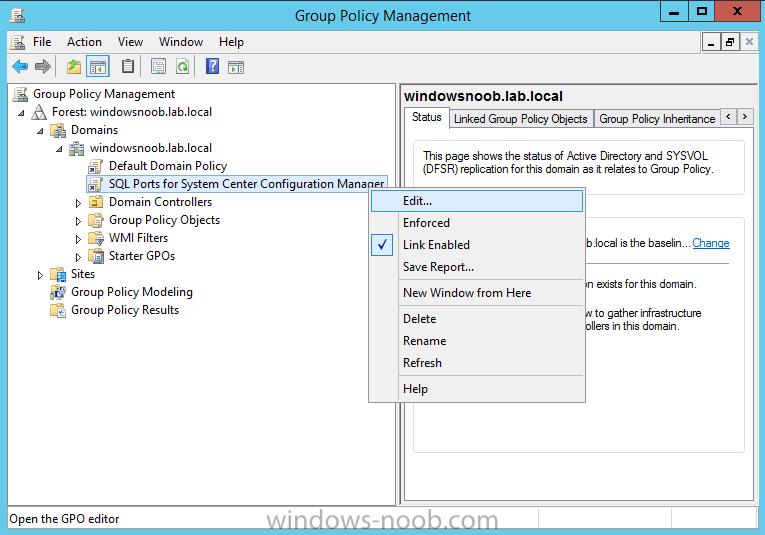 Start the Group Policy Management tool (GPMC.MSC) and create a new GPO. Note: In the preceding screenshot I link the GPO to the domain GPO however you should consider creating an OU specifically for your Configuration Manager servers and target this GPO only to that OU (your Configuration Manager servers require this GPO for SQL replication). 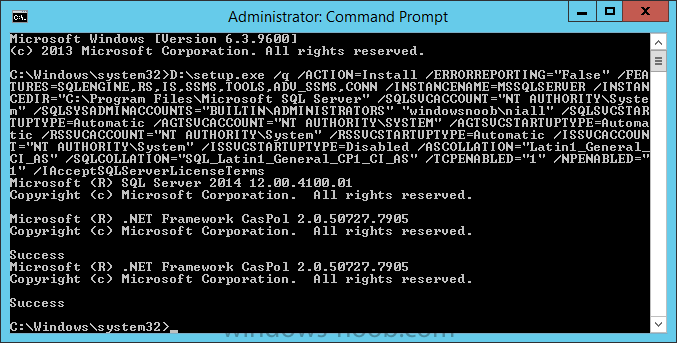 Give the GPO a name such as SQL Ports for System Center Configuration Manager. When done, right click on the GPO and choose Edit. Select Computer Configuration, Policies, Windows Settings, Security Settings, Windows Firewall with Advanced Security and select Inbound Rules, choose New Rule and follow the wizard for opening up TCP port 1433 as per this guide on Technet. Once done, repeat the above for TCP Port 4022. Optional: Once the above is done, and if you intend on using the PowerShell script in Step 2 to create users and to make a user a local admin on the CM01 server, create another GPO called Allow Inbound File and Printer sharing exception which sets Windows Firewall: Allow inbound file and printer sharing exception to Enabled. 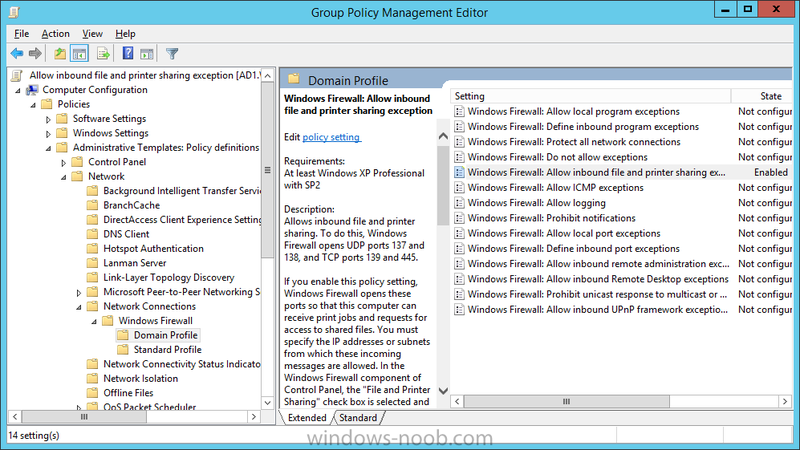 This policy is located in Computer Configuration, Administrative Templates, Network, Network Connections, Windows Firewall, Domain Profile. 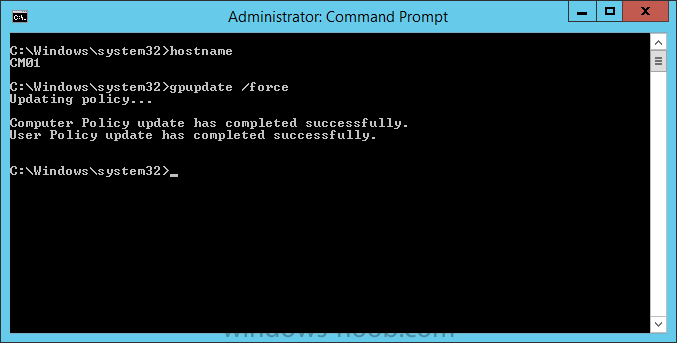 Once done, apply the GPO's by running gpupdate /force on CM01. 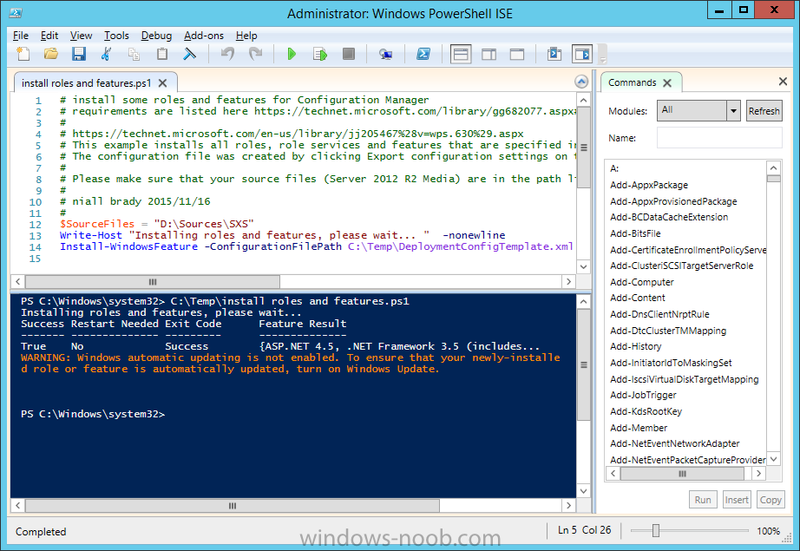 You can do this step manually or automated using the supplied PowerShell script. * CM_SR used for reporting services. 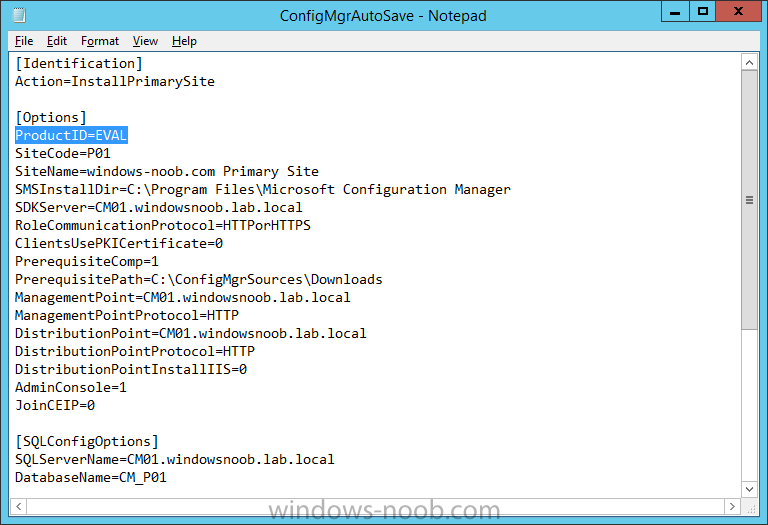 * CM_CP, a domain user used when installing the Configuration Manager Client for Client Push. Copy the script to AD1, start Windows PowerShell ISE as Administrator and open the Create Users Usergroups and OU in AD.ps1 script. Edit the variables as desired before running. Note: You need to edit the script and adjust the variables to your liking, for example if you want to change the default password. You may also want to rem out the MDT and MBAM user/groups that are created and change some of the user names within the script. After running the PowerShell script in Windows PowerShell ISE you'll see something like the following. 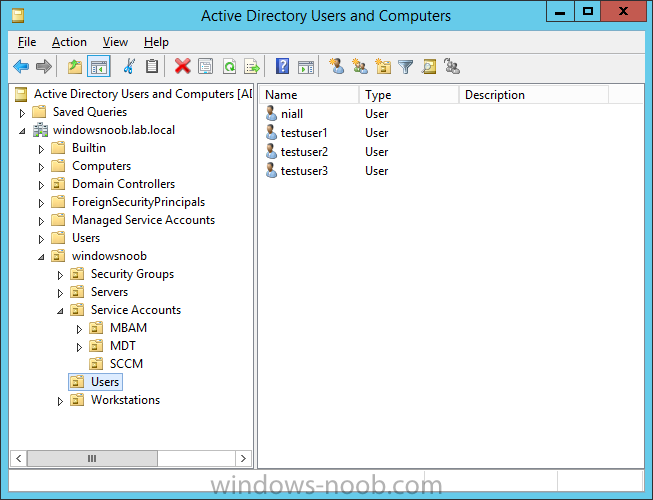 and in Active Directory Users and Groups you can see the OU and structure it has created. 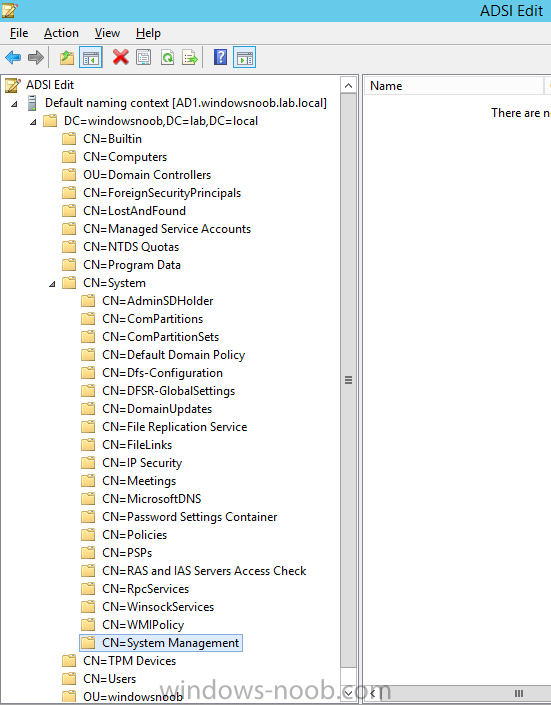 Open ADSI Edit, click on Action, Connect To and click Ok, Double Click on Default Naming Context and the DC= that appears below it. Click on the + and scroll down to CN=System. Open Active Directory Users and Computers. Click on view, select Advanced Features. Select the System Management Container, and right click it, choose All Tasks and Delegate Control. 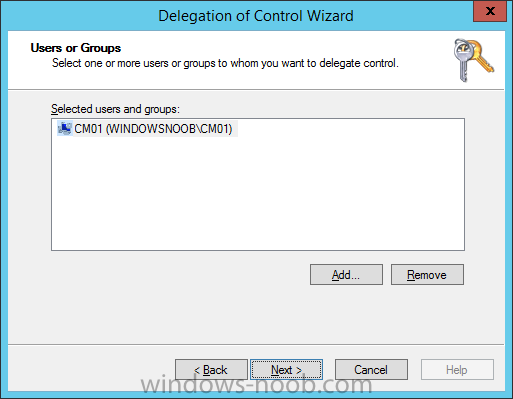 When the Welcome to Delegation of Control Wizard appears click next, then click Add. click on Object Types, select Computers. Type in your Configuration Manager server name (CM01) and click on Check Names, it should resolve. Tip: Repeat the above for each site server that you install in a Hierarchy. 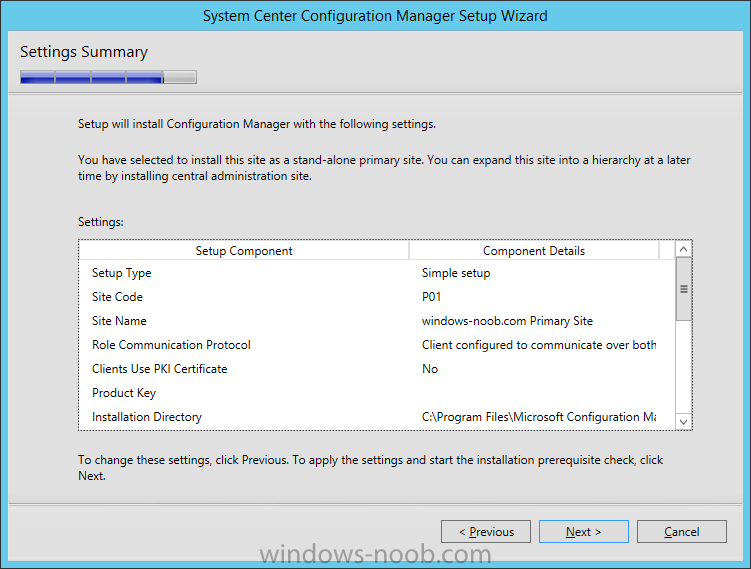 To support the various features in System Center Configuration Manager, the setup wizard requires some Server Roles and Features pre-installed on CM01, so let's go ahead and install them. On CM01, login as the username you added to the Local Administrators group and navigate to C:\Temp. The XML files within the Scripts Used in This Guide.zip were created using the Export Configuration File option in Server Manager after manually installing roles and features and the accompanying PowerShell script simply installs it. Note: Make sure your Server 2012R2 media is in the drive specified in the script or edit the script to point to the location of the media. 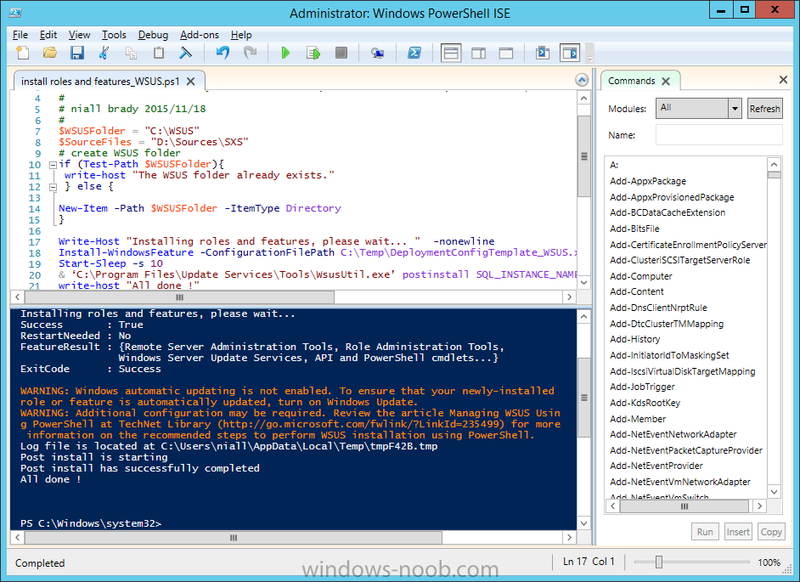 To install the roles and features needed, start Windows Powershell ISE as Administrator and run the install roles and features.ps1 script. 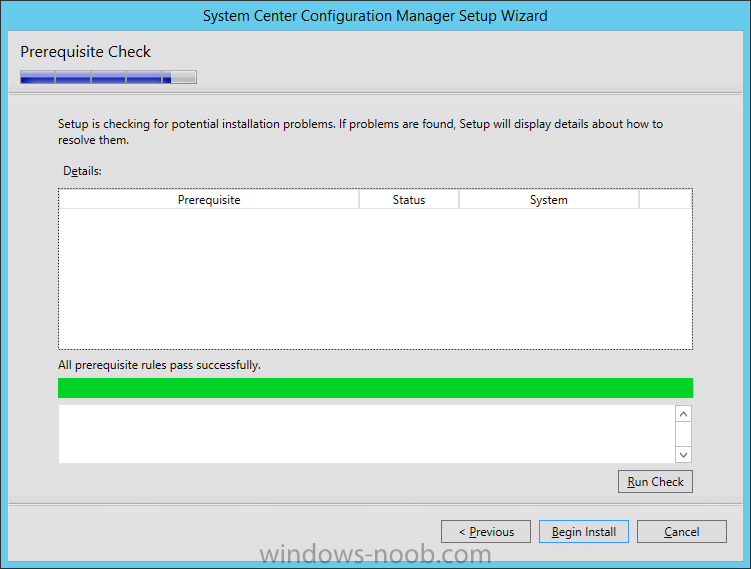 The ConfigMgr prerequisite checker will check for various things, including ADK components such as USMT and Windows Preinstallation Environment (amongst others), therefore you need to install Windows ADK on your server. To do so, either download ADKsetup from here and manually install it or run the setup ADK and WDS.ps1 PowerShell script to download and install the correct components for you. This script not only downloads the components needed, it's also installs ADK 10 and then installs Windows Deployment Services. 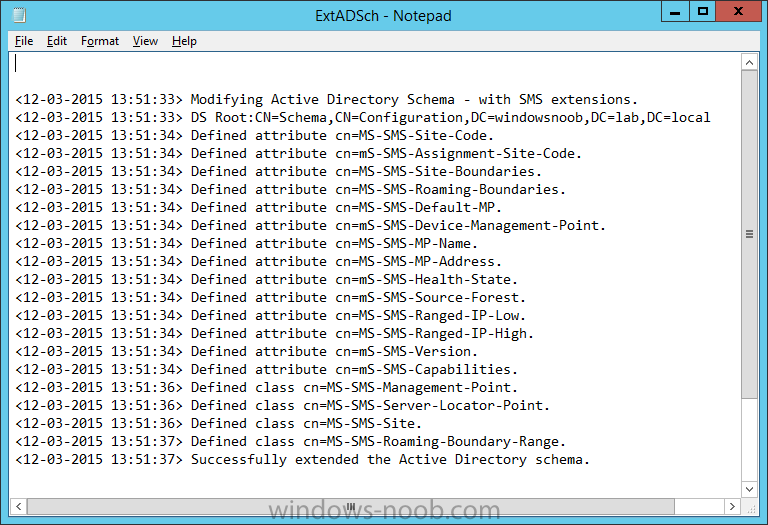 The setup ADK and WDS.ps1 PowerShell script is available in the Scripts Used in this Guide zip file. Note: due to issues with Windows ADK 10 for build 1511,I'm using the original Windows 10 ADK in the download script. Update: ADK 1511 has got a hotfix (March 2nd, 2016) to fix the previous issues, please read the updated blog about that here. 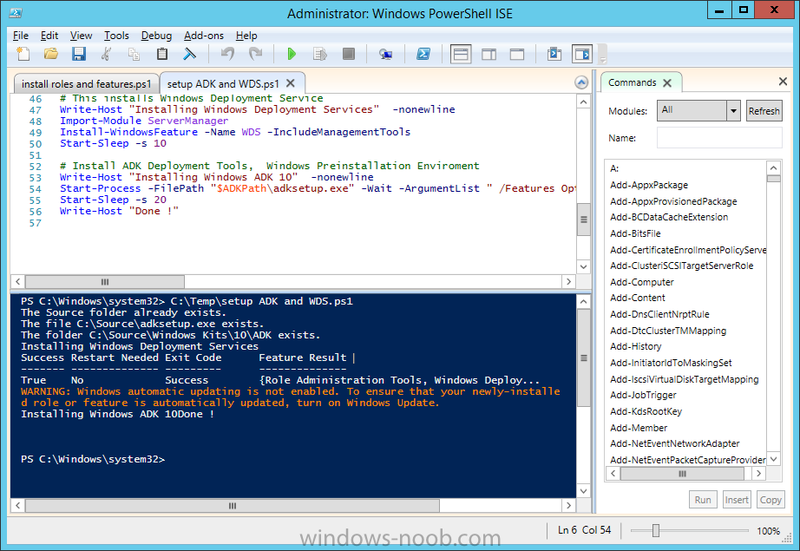 To download and then install Windows ADK 10 with the components needed, start Windows Powershell ISE as Administrator and run the setup ADK and WDS.ps1 script. Tip: If you want to get some great advice from a former SQL MVP (but now ECM MVP) about how to properly setup SQL and best practice tips, please review this blog post from Steve Thompson. 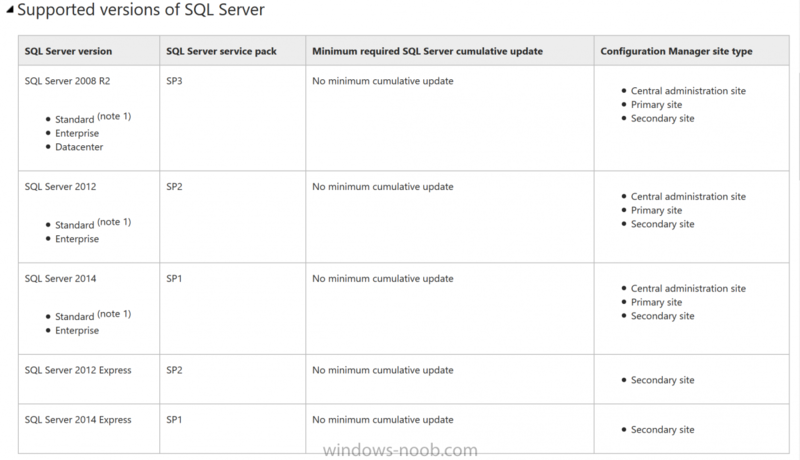 The command line below will install SQL Server with the correct collation needed for ConfigMgr to the following location: C:\Program Files\Microsoft SQL Server. If you don't want to use that location you can change it by modifying the /INSTANCEDIR reference. In addition, make sure to place your SQL Server 2014 media in the appropriate drive before running the script, if it's on a different drive letter, modify D:\setup.exe accordingly. 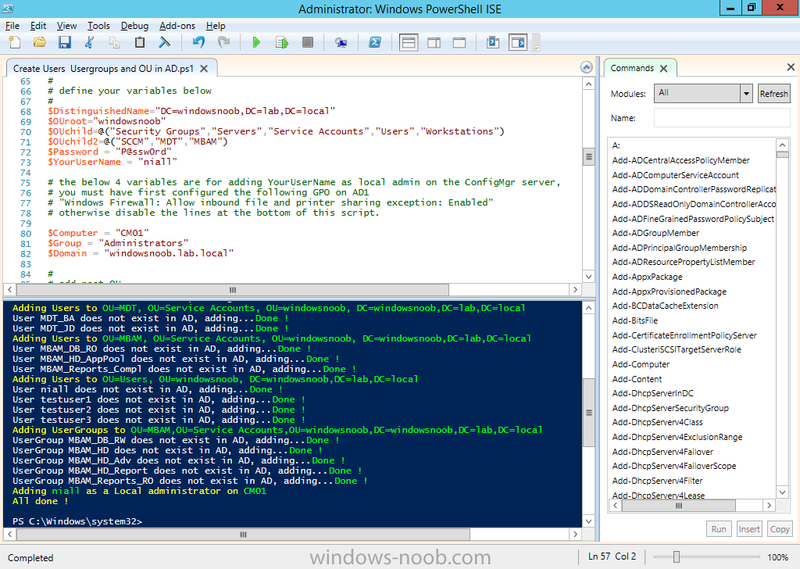 To start the install, open an administrative cmd prompt on CM01 and change "windowsnoob\niall" to match your domain\username, after you've made the edit, press enter to install SQL Server 2014. Once installed, you should see success messages like below, if not, troubleshoot the errors and/or review your command line for typos. Depending on your memory configuration and server setup, you may also want to configure SQL memory limits as per the following guidance prior to installing ConfigMgr otherwise you'll get warnings in the Prerequisite checker when it runs the Server Readiness checks. Configuration Manager requires SQL Server to reserve a minimum of 8 gigabytes (GB) of memory for the central administration site and primary site and a minimum of 4 gigabytes (GB) for the secondary site. This memory is reserved by using the Minimum server memory setting under Server Memory Options and is configured by using SQL Server Management Studio. For more information about how to set a fixed amount of memory, see here. If your SQL Server is configured for unlimited memory usage, you should configure SQL Server memory to have a maximum limit. Microsoft recently blogged about an Important update for WSUS 4.0 (KB 3095113). This update allows WSUS 4.0 to use the new Upgrades classification in WSUS 4.0 (Windows Server 2012R2). Failure to install the hotfix will mean that WSUS will not have the Upgrades Classification even though ConfigMgr version 1511 will show this classification in the SUP properties. In addition, this hotfix is mandatory to support Windows 10 servicing via Software Update Management. Before you can install the hotfix however you need a bunch of prerequisite updates and feature packs installed and then you need to install WSUS 4.0. The order of the installation of these updates is important too so I'm listing it here. The installation of some of these updates involve restarts. The installation of the WSUS 4.0 (KB 3095113) will take place immediately after installing WSUS 4.0 and is covered in the next step. 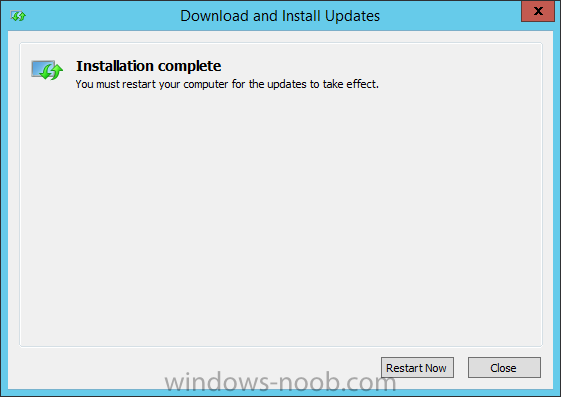 Note: In this guide I assume you've not yet installed any updates on your server and you are setting things up from Windows Server 2012R2 media (the original release of Server 2012R2). If you are trying this on a server that is already updated via Windows Update, then some of the updates below may already be installed or superseded. However if that is the case, try and install any remaining updates in the same order as below. In addition, if you are using Server 2012R2 with Update media, then you'll only need to install the first two in the list below. 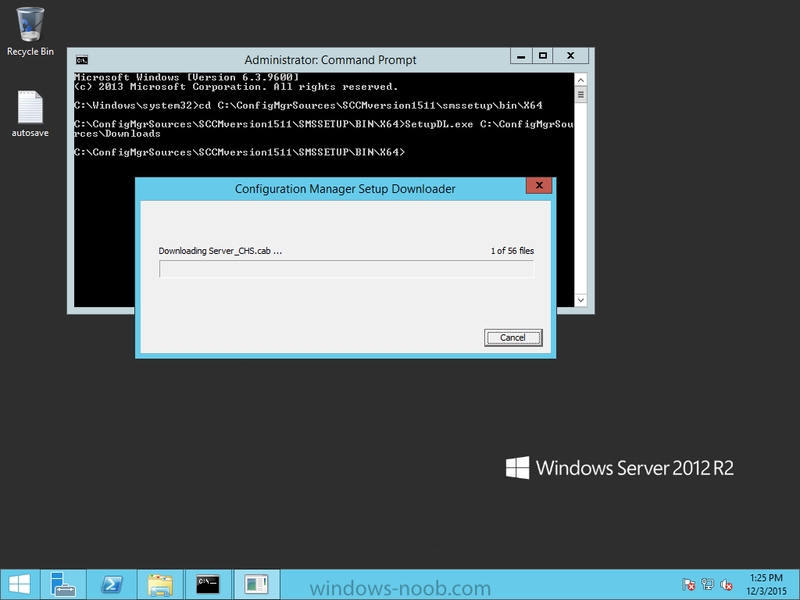 Then run the install roles and features_WSUS.ps1 script. Finally, you can install the WSUS Upgrades Classification hotfix. Restart the server when prompted to do so. Note: Even though you have installed the Hotfix required to do Windows 10 servicing, the WSUS classifications will not display the Upgrades classification until the ConfigMgr Software Update Point has performed a successful sync. 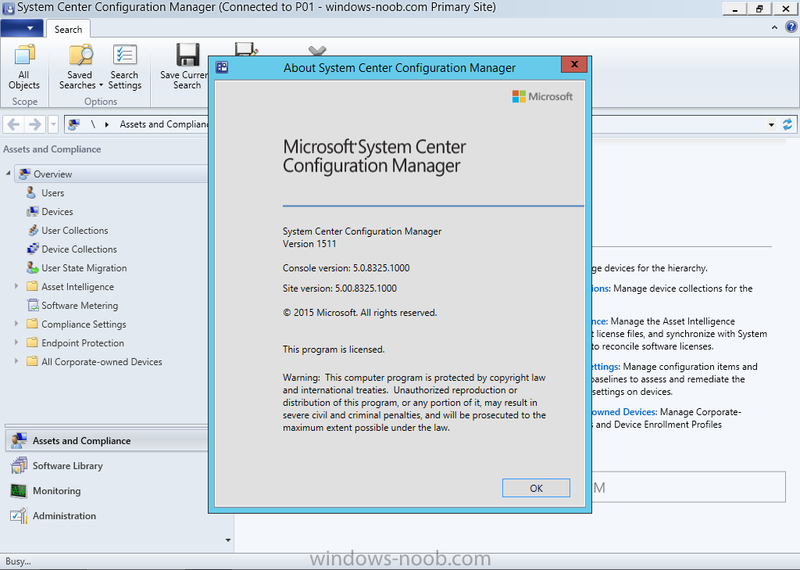 To install System Center Configuration Manager version 1511 you'll need to download the content. You can download it from Microsoft's Volume license site for use in production or from MSDN for use in a lab. For the purposes of this guide I used the following content from MSDN. This iso is named mu_system_center_configuration_manager_version_1511_x86_x64_dvd_7295963.iso and is 1.20GB in size. 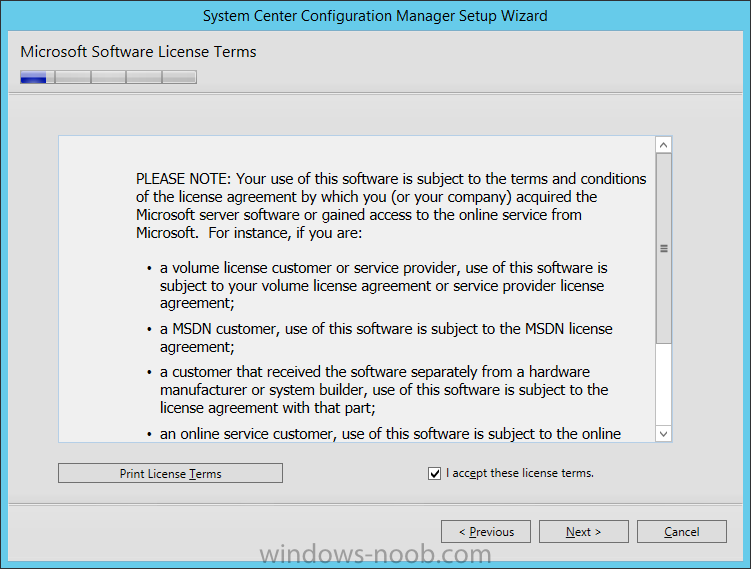 The VLSC content is called System Center Config Mgr Client Mgmt License (current branch). 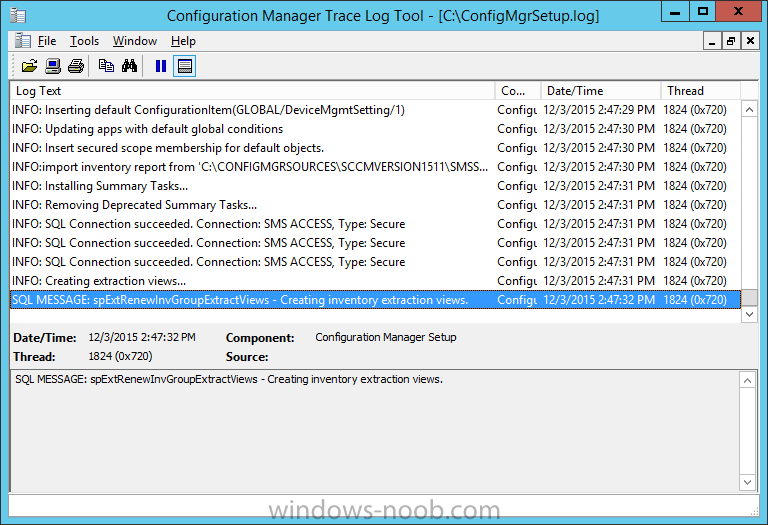 Tip: Browse to C:\ConfigMgrSources\SCCMversion1511\SMSSETUP\TOOLS and double click on CMTrace.exe, answer Yes to the default logging question. 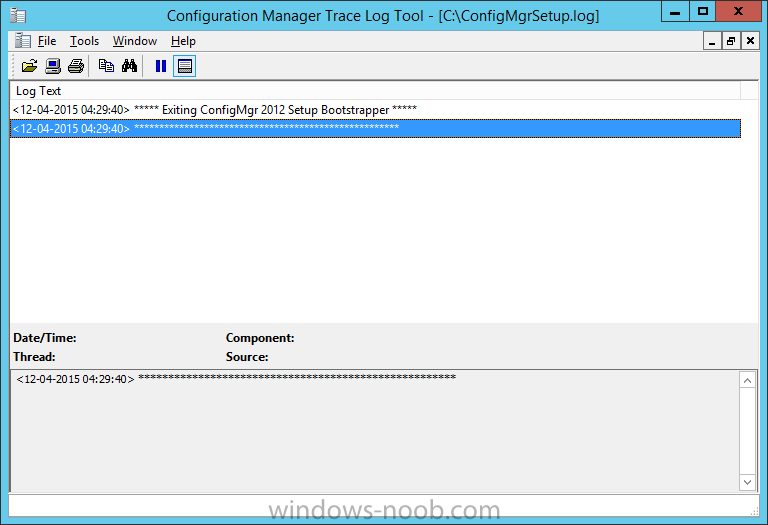 Then, using Windows File Explorer, browse to C:\ and double click on ConfigMgrSetup.log which will open the log file in CMTrace. This will allow you to view any errors or problems with the download of the prerequisites in real time. Note: Perform the following on the Domain controller server (AD1) as Administrator. You do not have to extend the Active Directory schema if it was already extended for Configuration Manager previously. locate extadsch.exe, right click and choose Run As Administrator. 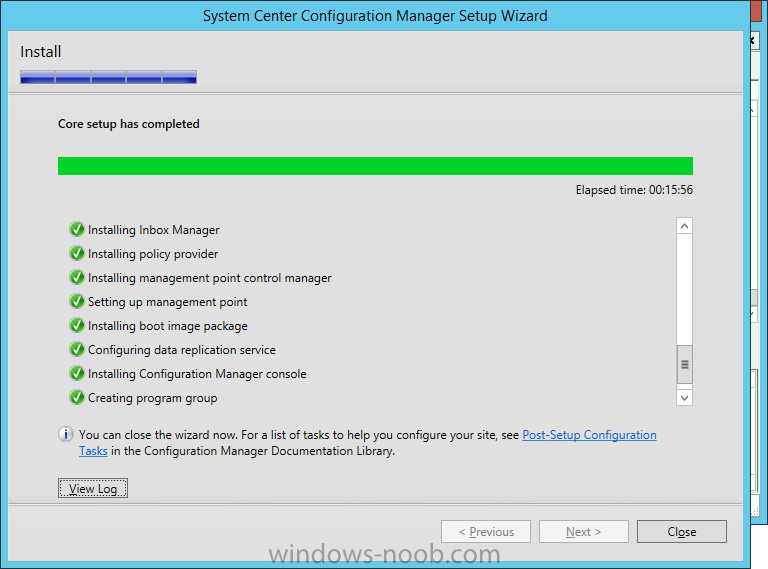 There are two ways to install ConfigMgr, manually using the ConfigMgr setup wizard or unattended. To install it manually use the settings below To do an unattended install jump to the next step. Browse to C:\ConfigMgrSources\SCCMversion1511 and click on Splash.HTA, notice the version number is clearly listed ! Note: In this release, you now have the option to install a Standalone Primary (recommended) or a CAS. 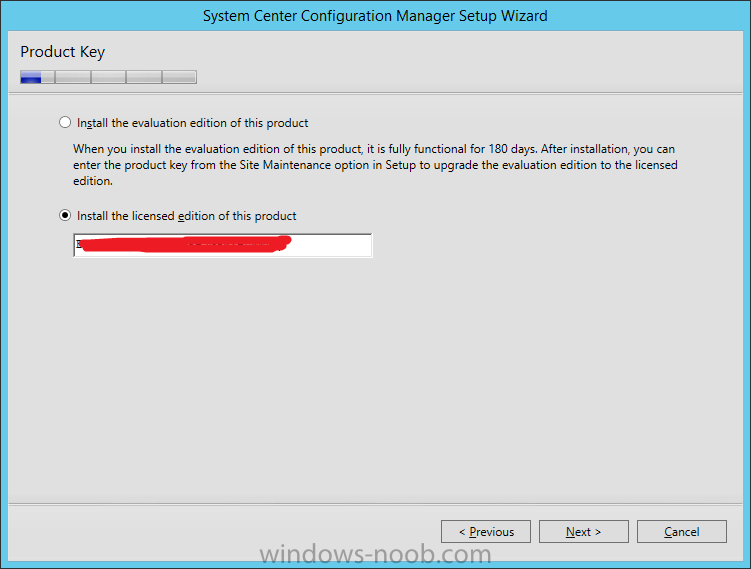 If running setup on an already installed site (such as Configuration Manager 2012 R2) you will be offered the Upgrade option. Select the option to Use typical installation options for a stand-alone primary site and click on Next. You'll be prompted with a note, read it before clicking on Yes. Next you get to install the licensed or evaluation version (180 days) of the product, choose your version and click on Next. Note: Change the Site Code, Site Name and Installation Folder to values that suit your environment, you can't change them later so think before clicking next. review the Usage Data screen, this gives you info about what data Microsoft collects and how you can change the User Data levels and settings choice at a later stage from within the ConfigMgr Console. 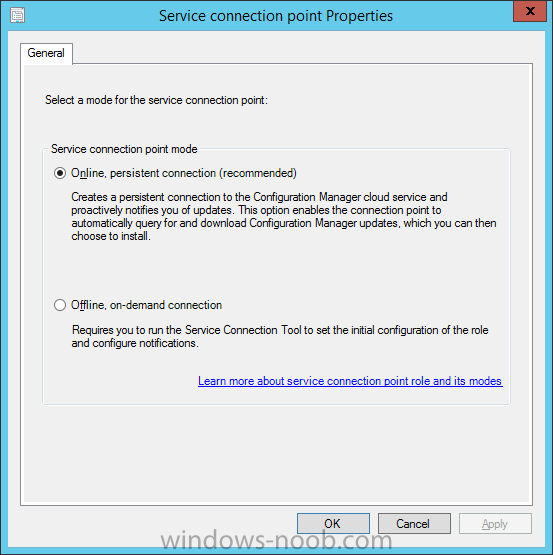 Next you get to decide about the Service Connection Point setup, this is required if you want to allow ConfigMgr to check for updates to avail of new features and inform you about those updates (much like Intune Extensions show up in ConfigMgr 2012 R2 with Microsoft Intune integrated) and this role is the basis of ConfigMgr as a Service. and if you followed this guide correctly all prerequisite rules pass successfully. and after a while you are done ! Below is a sample ConfigMgrAutoSave.ini file created from the above installation choices I made, I've removed the ProductID and SysCenterID values however. You can find a copy of the above file in the Scripts Used in This Guide.zip file. Note: You will need to edit this file and replace the values with those that work in your environment. For example, to change the ProductId open the file in notepad, locate the line that reads ProductID= and either enter your ConfigMgr Product Key or use the evaluation version of ConfigMgr by entering the word EVAL as shown below. 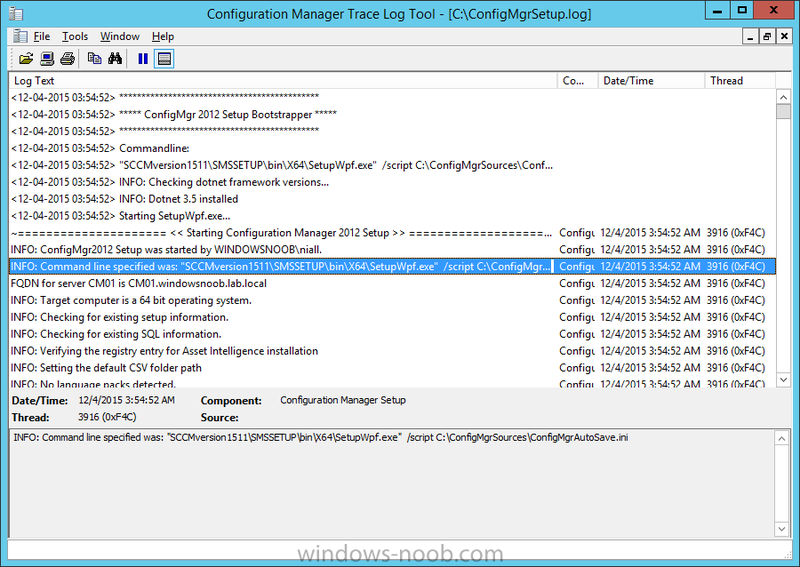 as the install is unattended you'll need to review the ConfigMgrSetup.log file stored in the root of C: using CMTrace to get a real time status of the installation. However you should open the main log (more than likely renamed to ConfigMgrSetup.LO_) file to verify there were no issues during setup. The above is great for doing unattended installs of ConfigMgr however If you want to automate this using PowerShell then you'll need to write your own script to convert the required values to variables or take a look at Johan Arwidmark's excellent hydration kit(s) or have a look at this sample to get you started on writing that script. Note: You'll have to tweak these scripts to suit your environment and to work with this release of Configuration Manager, however, the ini file I've provided should be enough to get you started. 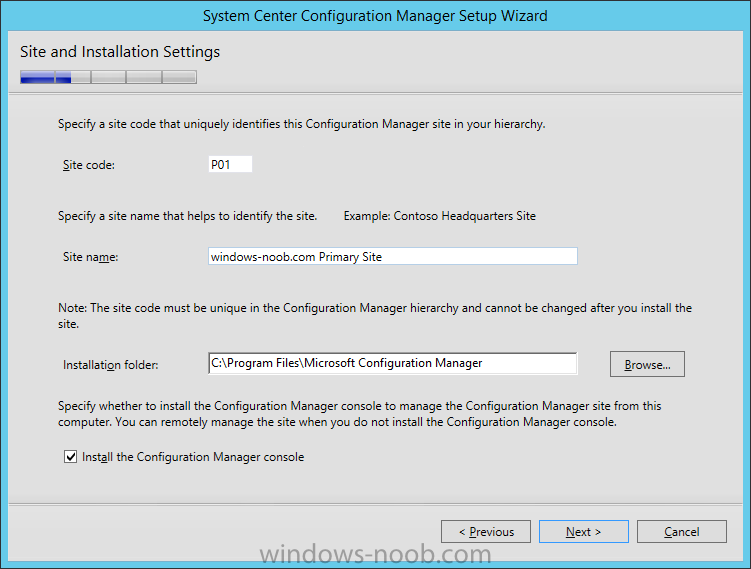 Launch the Configuration Manager console via the start screen and click on the white downward pointing arrow in the top left of the console then click on About Configuration Manager, notice the version info, and that it says Version 1511. Next, take a look at the top line of the ConfigMgr console to reveal whether you are running a licensed or evaluation version. Below is how the evaluation version will appear. Earlier in this guide you saw a Usage Data information screen with no configurable options. 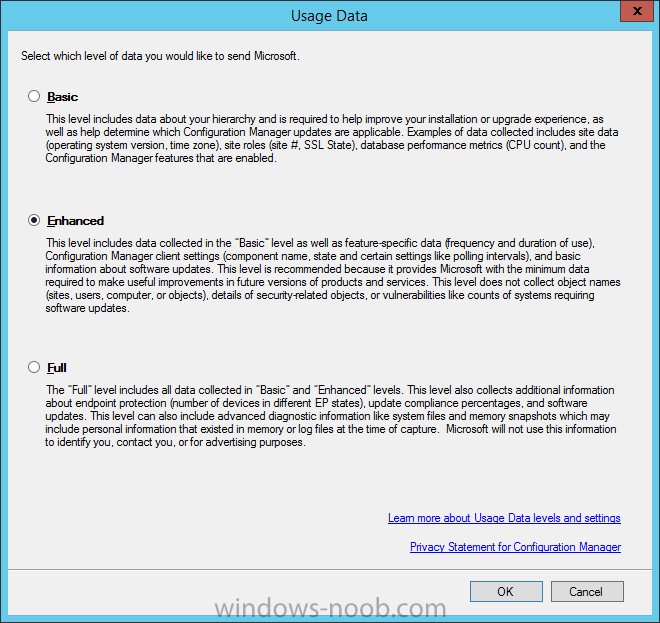 To configure what Usage Data is sent to Microsoft do as follows. In the ConfigMgr Console, click on the white downward pointing arrow in the top left, and select Usage Data from the options available. You can click on the two clickable links provided to get more info about what these Usage Data settings and levels mean. During setup you have the choice of installing the Service Connection Point role (or skipping it). You can configure this by selecting Administration, Servers and Site System roles, select your Primary site and then select the Service Connection Point role from the roles listed as installed on the server. The options available are Online or Offline. If you do choose offline then you'll have to use the Service Connection Point tool to manually setup the role and configure notifications. 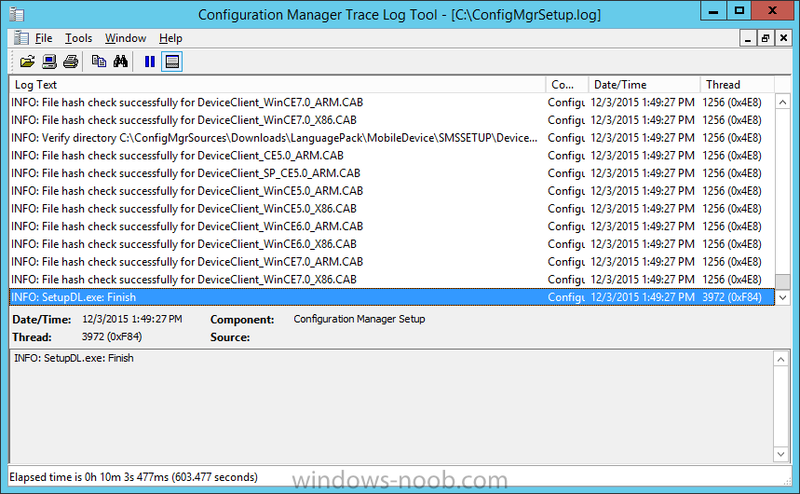 Update ConfigMgr easily each and every time new Windows capabilities are released. Update ConfigMgr each and every time updates for iOS and Android are released. Deliver the single-pane-of-glass for managing all devices – with immediate support across Windows, iOS and Android without you having to go through complex individual upgrades. We’ll do the work for you. Exciting times are ahead ! thanks for reading, and until next time, adios. Next Post > Configuring Discovery. Excellent Notes. I am going to use this to rebuild home lab next week. Still trying to get all the information to make sure the install will go smoothly. Thankyou for all Your brilliant guides :-). I've learned som much from you over the years. Now I do have one suggestion to this guide. I made this litle script for detecting if "I was ready" to install KB3095113. This is a feature pack and if you try installing the rest of the updates manually they will tell you that the feture pack update for KBXXXXXX is already installed. KB2919355 is all bundled and if you installed it its all good. Now KB2919442 is giving me: This update is not applicable to your computer..ok...why? I recently upgraded to 1511 and I can't seem to find any information on if the endpoint protection is the same as it was in 2012 R2 or if we the end user should be seeing something different. I am running Windows 10 and all I see on my computer is Windows Defender. My SCCM Client has updated so I'm just wondering if I have something configured incorrectly. First of all, love the step by step. I'm currently in the process of setting up or new site, moving from ConfigMgr 2007 R3. Our current setup is configured on one box. 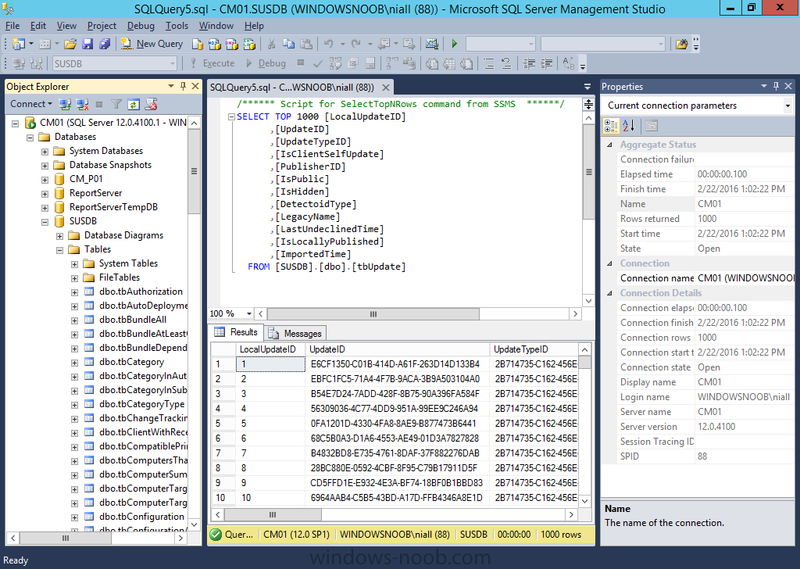 We are now separating the DB from the SCCM server. So as a result I have some questions. Add to that the current configuration does not have the firewall service enabled so I have nothing to mirror or Is it necessary to add the DB server to the System Management container along with the main site server? Also, the GP you created for the SQL firewall port configuration will be effective on all site servers. We are not using a GP should I configure the firewall ports 1433 & 4022 on the ConfigMgr server as well as the separated SQL server? Any additional considerations I should be aware of? I appreciate any input. Thanks! If you don't have the Windows Firewall enabled, you don't need to create those settings in a GPO, or locally. Just make sure that the required ports are open on the network-level. 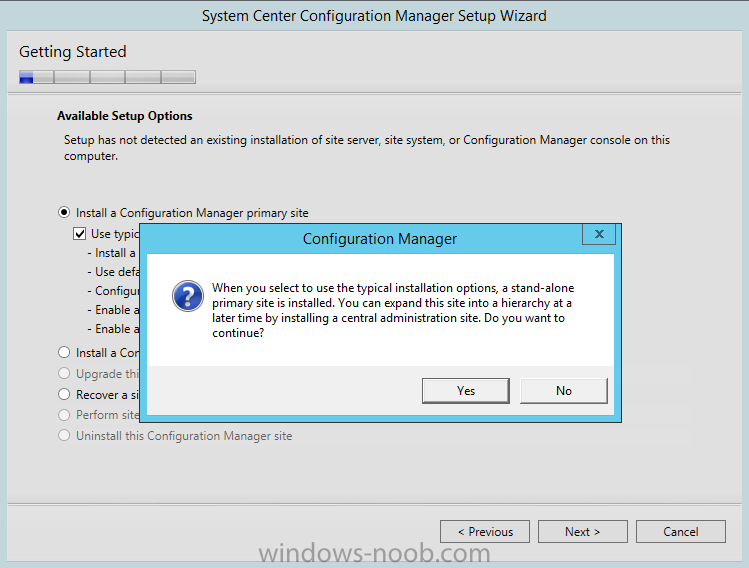 Only the ConfigMgr site server needs permissions to the System Management container. The database server doesn't have to write anything in that container. We have a SCCM 2012 R2 SP1 and it is runing fine. I am using here Win2008R2, SQL2008R2. But I want to upgrade to SCCM 1511. 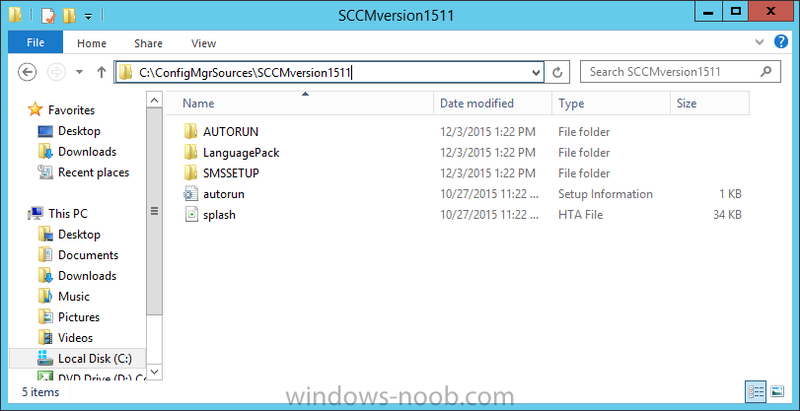 It is not easy to upgrade to sccm1511 because of SQL version. . I want to use on the new machine wind2012R2 and SQL2014SP1, therfore I cannot use backup/restore because of database the SQL is not supported. "A site server or site system role is already installed on the computer selected for site server installation. Remove the site or site system role from the computer, or select another computer for site server installation." and "Microsoft Remote Differential Compression (RDC) library must be registered for Configuration Manager site server installation. Details at http://technet.microsoft.com/library/cc431377.aspx#RDC_for_Site_Servers." have you tried backing up the db, then upgrade SQL from SQL 2008 to SQL 2014sp1, then do a new backup & do a restore to the new hardware/os. I have two drives setup on my server, C:\ ("System" drive) of course and E:\ (SCCM). 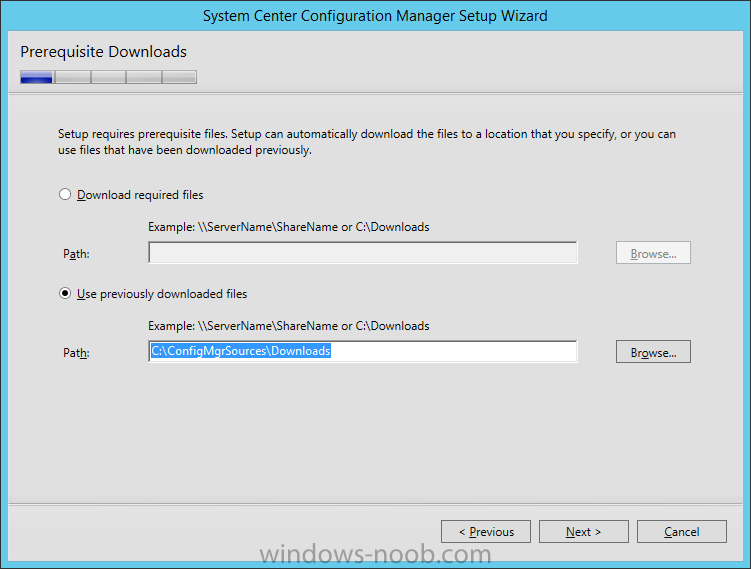 Is it best practice to install SCCM to its own drive or install to the default, C:\Program Files\...? Just curious what most do when installing. Thank you! "For the best performance, place each object on a separate, dedicated RAID volume. For all data volumes (Configuration Manager and its database files), use RAID 10 for the best performance." I really enjoy these walk troughs, Great! However, after sever trials and tribulations reading and adjusting to my infrastructure constraints, I have discovered that the ‘DeploymentConfigTemplate_WSUS.xml’ needed to be adjusted. I was being plagued with the server needed to be rebooted error when attempting to install WSUS. So I tried to parse and read the ‘DeploymentConfigTemplate_WSUS.xml’ and since I do not currently know of an editor for these type template files, I had to walk through, recreate and compare. I discovered that the WID (Windows Internal Database) was causing the issue. Due to the fact we are installing to a full SQL server build, we do not need the WID. For some reason even if you unselect the ‘WID Database’ option in role services, it does not uncheck the Feature installation of WID. So you have to go back and uncheck the ‘Windows Internal Database’ in the Features list. interesting because it's not configured after running the script and I too am using SQL to host the WSUS DB. were you seeing otherwise ? what version of Windows Server 2012 R2 did you run the script on ? Great guide as usual. I downloaded the latest Technical Preview and then used this guide to get it all setup. It seems to be functioning however it's not creating the boundaries nor is it finding any of the other computers on my network. Any ideas what I might have done wrong? I've checked the firewall GPO. I suspect the problem is that none of the other computers have any SCCM related user accounts. All and any comments greatly appreciated. I downloaded the latest Technical Preview and then used this guide to get it all setup. It seems to be functioning however it's not creating the boundaries nor is it finding any of the other computers on my network. Any ideas what I might have done wrong? I've checked the firewall GPO. I suspect the problem is that none of the other computers have any SCCM related user accounts. I'm having an odd problem. When the Prereq check runs, I'm getting a fail on SQL TCP port. As far as I can tell I have TCP port is specified (1433) and enabled, I have the firewall rules. I'm not sure what I'm missing. I'm going to try to reinstall SQL and see what happens. Has anyone else seen this yet? Update! : So I'm an idiot and downloaded a SQL 2014 x86 instead of x64. Installing x64 solved my problem. We have an Education Volume License and I cannot find 1511 or 1602 in the Microsoft Volume Licensing site. Where can I download the current version?? Fatal error: No such host is known and the script does not create a database "SUSDB"
2016-04-06 15:15:02 Creating share "UpdateServicesPackages" with path "C:\WSUS\UpdateServicesPackages" and description "A network share to be used by client systems for collecting all software packages (usually applications) published on this WSUS system." 2016-04-06 15:15:03 Creating share "WsusContent" with path "C:\WSUS\WsusContent" and description "A network share to be used by Local Publishing to place published content on this WSUS system." 2016-04-06 15:15:03 Creating share "WSUSTemp" with path "C:\Program Files\Update Services\LogFiles\WSUSTemp" and description "A network share used by Local Publishing from a Remote WSUS Console Instance."